I had six hours to kill last weekend and had a hankering for some Francis Ford Coppola. So I popped in The Godfather and gave it my first viewing since 2009. After the movie, I was tempted to just pop in The Godfather Part II but I resisted. Not for any reason in particular. 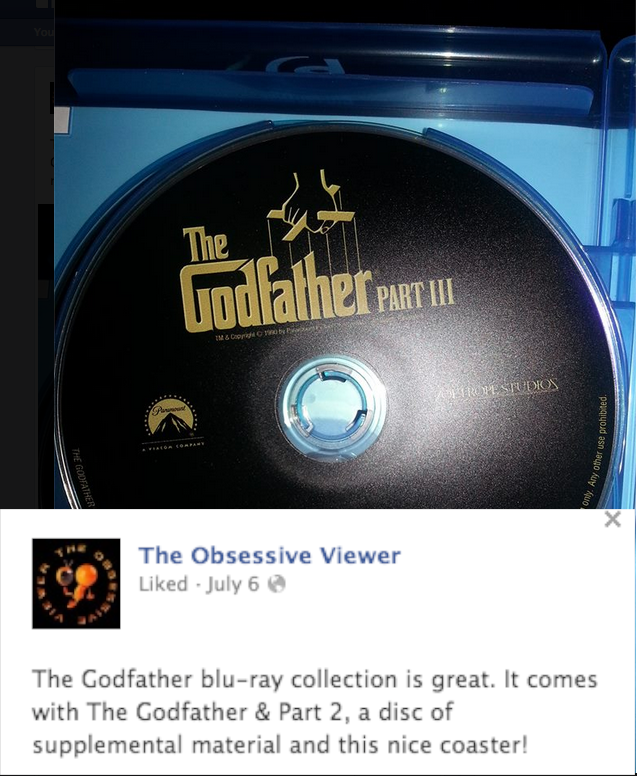 I love The Godfather Part II and will definitely give it a rewatch soon, while its predecessor is still fresh in my mind. Instead, I broke out my DVD of Apocalypse Now. I hadn’t seen that movie since high school. So I was incredibly overdue. You can read my thoughts below. A crime family experiences a shakeup in leadership while in a dispute over entering the drug game. I stand by that. The Godfather Part III is hard to watch in its awfulness. 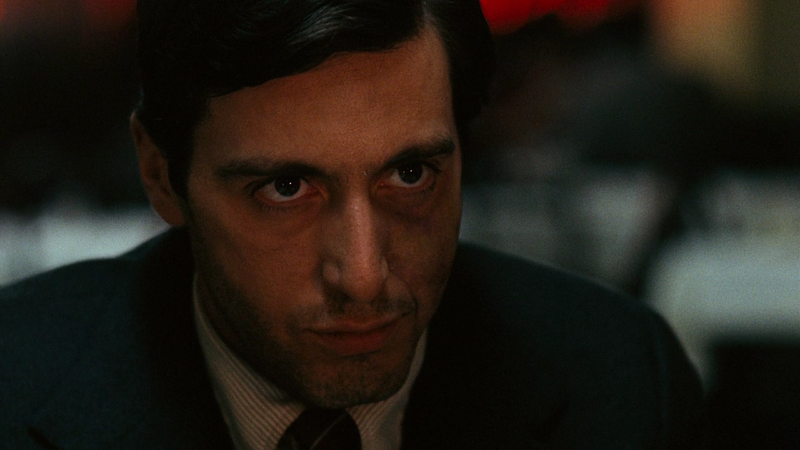 When it comes to discussing The Godfather, however, how can I do Coppola’s gangster masterpiece any justice? It’s one of those movies that is just untouchable in my eyes. You can dislike it all you want, but nothing you say will change my opinion. It’s what I call a “pedestal movie.” I hold the film up to such a high standard, that I’ve put it on a pedestal, never to come down. Every performance here is a standout. It’s a great ensemble cast. Marlon Brando as Don Vito Corleone is masterful. A young Al Pacino playing Michael Corleone as a reserved war hero reluctant to dive into the family business, is one of my favorite performances of all time. Mario Puzo, Coppola and Pacino created one of the best developed characters in film history with Michael Corleone in The Godfather and The Godfather Part II. The overarching themes of family and doing right by your own are universal. When Sonny attacks his brother-in-law in the streets, you feel the urge to cheer on the violence. James Caan’s portrayal of Sonny, by the way, is a joy to watch. He’s arrogant and volatile but sympathetic all the same. Coppola makes you care about the Corleone family to the point where it’s hard to see any of them fall. One of my favorite scenes features Brando calling in a favor from an undertaker. Given the Don’s “strictly business” demeanor throughout the movie, his expression of such raw emotion is simply jarring. 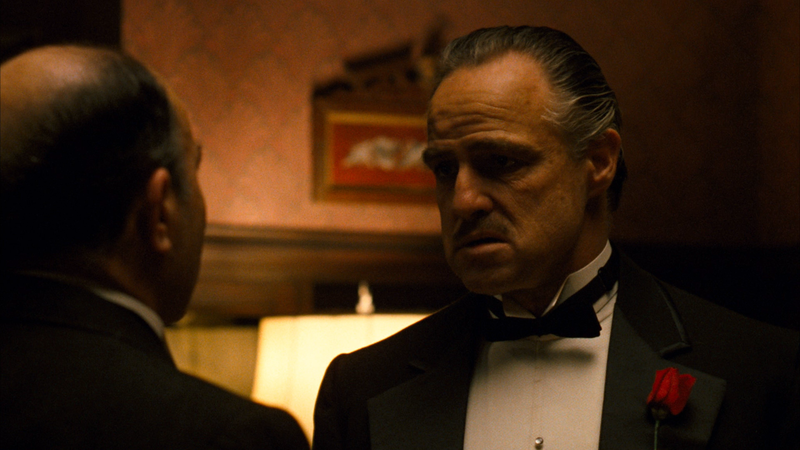 The Godfather is one of the most celebrated and oft-referenced films in cinema history. It earned its acclaim with pristine writing, legendary cinematography and impeccable acting in every spectacular frame. With such iconic scenes in its arsenal and a sequel that is every bit as incredible, The Godfather is sure to stand the test of time and continue to be influential to young filmmakers for generations to come. Buy Mario Puzo’s “The Godfather” on Amazon. During the Vietnam War, a soldier is sent to Cambodia on a secret mission to kill a rogue Colonel who has gone insane. Boy, did I miss a LOT when I watched this movie in high school. 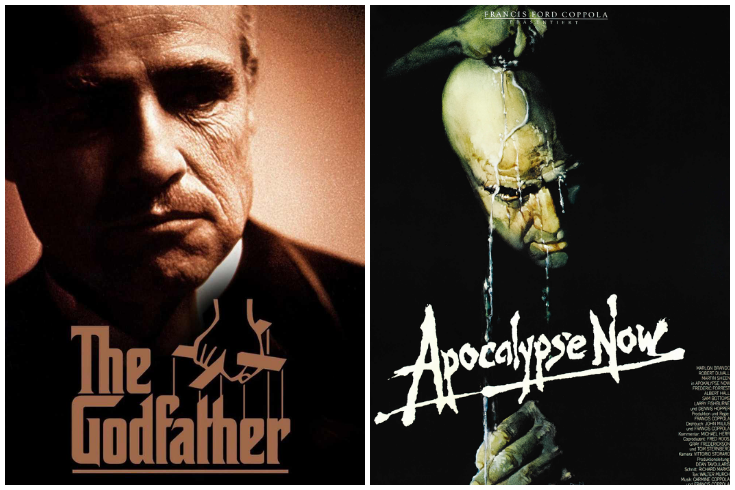 The first time I watched Apocalypse Now was in the early days of Netflix when I started going through a massive backlog of movies I should have seen but hadn’t gotten around to yet. When Apocalypse Now finally made it to my mailbox, I decided to watch it while my brother was asleep in our shared room. I viewed it on a laptop in the middle of the night with headphones. To say I missed some things is an understatement. I watched it at a time where I was seeking out war movies. It was after I had watched and became obsessive over Saving Private Ryan. What I expected from Apocalypse Now was a straight Vietnam War film. What I wasn’t prepared for was the deep journey into the madness of war and the fragility of the human mind that Francis Ford Coppola so brilliantly presented. Needless to say, I came away from it feeling letdown. I eventually bought the DVD but didn’t break it out until now. I watched the original version last weekend. I’m saving Redux for when I buy the blu-ray. 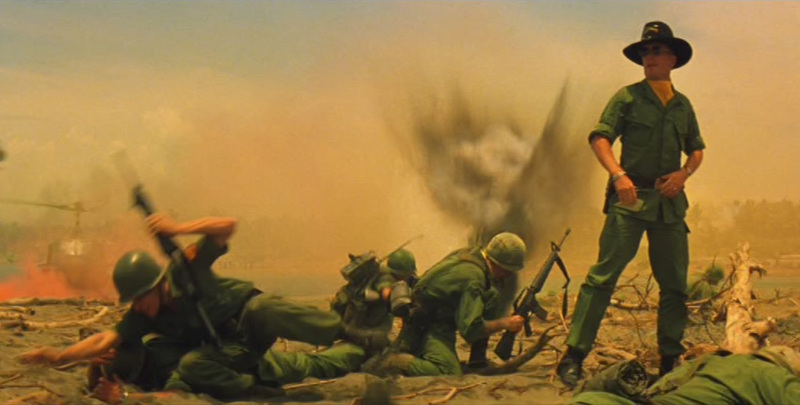 What immediately got me about Apocalypse Now this time around was the surrealistic nature of the filmmaking. Coppola did an amazing job presenting the war sequences in an unnatural, unnerving manner. The scenes featuring Robert Duvall (a pedestal performance if ever I saw one) as Kilgore were incredible in their depiction of a man at home in war. Sprinkling in bizarre moments (like the film crew directing the soldiers) was a brilliant addition to the mayhem on the screen. Ride of the Valkyries was an element that went way over my head the first time I saw it. I had written off the use of Wagner’s music as some goofy comic relief. This time around I was amazed at the dichotomy that playing Wagner in scenes of war presented. The effect makes for a jarring experience as the viewer watches the helicopters’ destruction while hearing beautiful music. In fact, every piece of music in this film serves the tone in a truly spectacular way. The movie’s score strikes an ominous tone. It helps paint a picture of foreboding as Willard gets closer and closer to Kurtz. The music sounds like a horror film and that compliments the imagery presented to us very well. It’s one of the best scores I’ve ever heard. The performances are, like The Godfather before it, masterpieces in their own right. Martin Sheen plays up his own character’s descent into the surreal as he travels into the heart of darkness in search of Kurtz. The crew of the boat he hitches a ride with succeed in carving out their own personas out of the potentially stereotypical. Dennis Hopper has one of his most memorable performances here as well. Marlon Brando as Colonel Kurtz is equally compelling and unsettling. While reading the trivia for the movie on IMDb, I had to stop. I wanted to save the details for when I eventually buy the Blu-Ray and watch the documentary Hearts of Darkness. Brando is a big part of my reasoning for that. According to what I read of the trivia, he showed up on set overweight and unprepared. He was disruptive on the set and made an already delicate production even more dramatic and troublesome. It simply amazes me that a situation like that could result in one of the greatest performances of the 20th century. It speaks to Brando’s acting talent and Coppola’s filmmaking ability (and patience). I told my friend Mike that Apocalypse Now is a perfect movie if you’re looking to spend as much time working out the themes and deeper meanings as you’ll spend actually watching it. It’s the truth. I’m still processing the movie and know all too well that I’ve only scratched the surface of the best that Apocalypse Now has to offer. What I know of it now is that it is the exceedingly rare movie that truly demands repeat viewings and can inspire different discussions with an array of interpretations. Buy the Full Disclosure edition Blu-Ray of Apocalypse Now here. Grab “Heart of Darkness” by Joseph Conrad on Amazon. I am really tempted to break away from my normal “Double Feature” format for this entry. I can’t, in all good conscience, choose one of these films over the other. For one thing, they are vastly different experiences that don’t lend themselves to side by side comparisons. I chose these two simply because I had six hours to kill and hadn’t seen them in a while. By pure happenstance, they have a director and some actors in common. If I must deliver a verdict, however, I would have to pick, in this moment in time, Apocalypse Now with an asterisk. I chose Apocalypse Now over The Godfather for the simple fact that it offers more to the viewer. The Godfather delivers everything it intends to deliver to the viewer on its surface. It’s not a slight on the film by any means. Apocalypse Now is an experience that is meant to inspire debate and be viewed and dissected in all its horrific glory. My caveat, of course, being that these two titans of American cinema are perfect films for the things they set out to achieve. The Godfather tells the perfect tale of violence and family. Apocalypse Now intertwines war and madness in a poetically beautiful and truly haunting manner. You truly can’t go wrong with either of these. Share your thoughts on these two masterpieces with me in the comments and don’t forget to follow me on Twitter @ObsessiveViewer, like the blog on Facebook and check out The Obsessive Viewer Podcast. This entry was posted in Matt Hurt's Columns, Movie Reviews and tagged Al Pacino, Apocalypse Now, Apocalypse Now Redux, cinema, Dennis Hopper, don vito corleone, Double Features, Francis Ford Coppola, Heart of Darkness, Hearts of Darkness, James Caan, Mario Puzo, Marlon Brando, michael corleone, Movie Columns, Ride of the Valkyries, Robert Duvall, Saving Private Ryan, The Godfather, The Godfather Part II, The Godfather Part III, Wagner. Bookmark the permalink. The “Heart of Darkness” documentary is great. I haven’t watched the Redux edition, but from what I have read and been told it is not a pleasant watch. Yeah, I’ve heard the Redux edition is less surreal and a little too long. I’ll check it out eventually, for sure.